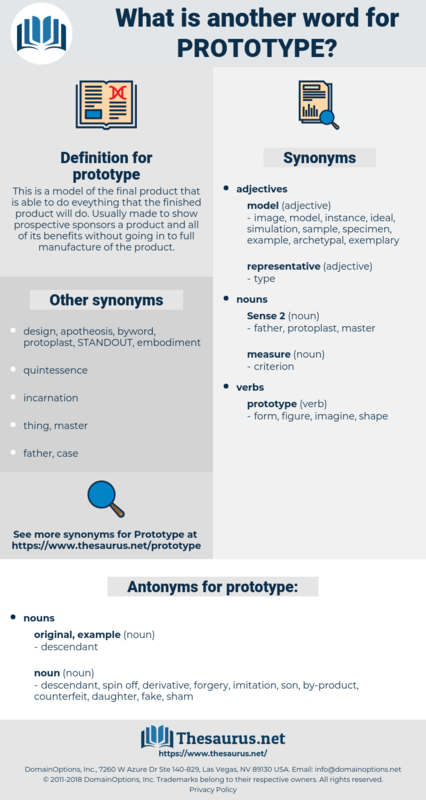 What is another word for prototype? This is a model of the final product that is able to do eveything that the finished product will do. Usually made to show prospective sponsors a product and all of its benefits without going in to full manufacture of the product. descendant, spin off, derivative, forgery, imitation, son, by-product, counterfeit, daughter, fake, sham. But there are no days on which he, or his prototype, is not on hand, and so the problem ever remains a present, an immediate, and, alas! 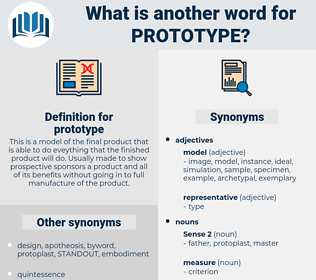 Of these the best known example is the now famous " Tale of Two Brothers" - the prototype of the " modern" short story.